The world of publishing in India has seen a flourish of debut authors in the last few years with many of them grabbing accolades and eyeballs of the media and young readers. So, I, too, decided to join the bandwagon and turned my attention to this growing breed of new Indian writers. 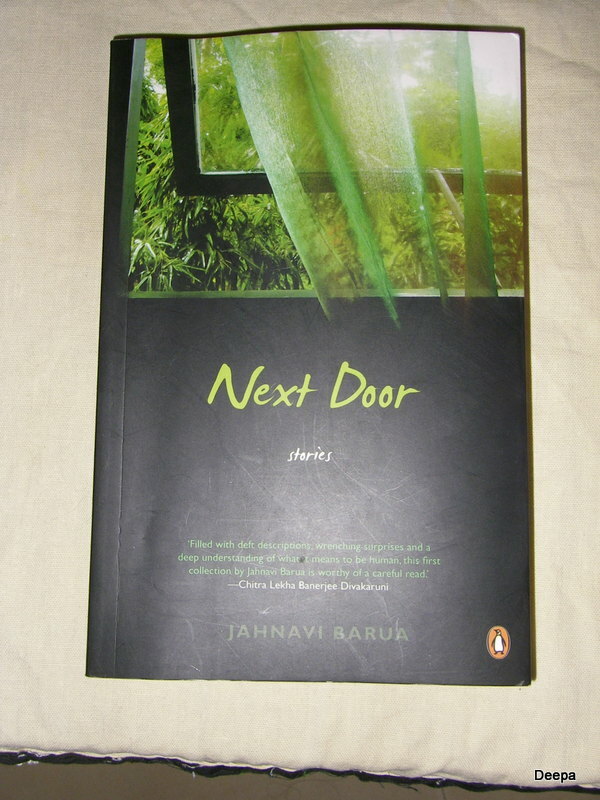 I picked up a collection of short stories ‘Next Door’ by Jahnavi Barua, published in 2008. This debut collection(of 11 stories) had garnered much critical acclaim and after reading the book, I can say it is well-deserved. Her writing is very mellifluous, filled with vivid descriptions and rich textures of her homeland, Assam, the North-eastern state of India, known for its natural beauty and tea gardens. Jahnavi’s stories are woven with intricate emotions and complex patterns that define human relationships.And just as the mighty Bramhaputra River, known for its flash floods, yet is the lifeline of the Assamese people, so also it flows through her stories quietly and at times, tumultuously. There’s also a sprinkling of Assamese words throughout, which though hard to understand, gives it a unique flavour. The story goes on to describe the rest of her day as she gets ready for school, witnesses an argument between her parents about bringing her paternal grandmother home, the walk to the school with her mother and then school itself. Her day ends rather unexpectedly on a tragic note and does indeed cast a spell on the reader. One day he sees some movement in the run-down house and finds a young injured boy, an insurgent,lying there. The insurgent initially bullies and threatens Mazumdar into bringing food and medicines for him and keeping his presence a secret. But over the days, as he tends to the young boy, Mazumdar develops a fatherly responsibility towards him and helps him to escape from getting arrested by his own son who is the Deputy Commissioner (with whom he apparently doesn’t share a great relationship). Another touching story is ‘Holiday Homework’. The protagonist, an old man, Mr Barua, after observing his new neighbours (a young couple and their son) and the intense love between the mother and the son for a few days, decides to befriend them, and soon discovers that the young lady is suffering from cancer. The rest of the story goes on to narrate the unusual friendship formed between the three of them and the climax, though predictable, is so moving, that it brought tears to my eyes. While some of the stories have an abrupt ending, they are still worth reading for her style of writing and keeps the reader engaged with even pace and unique plots . Jahnavi has previously won the Short Fiction contest hosted by British Council in ’05 and the second prize in the Children’s Fiction category of the same in 2006; but with this book, she has truly arrived in the world of literature . Her latest book, ‘Rebirth’ (2011), a novel, was shortlisted for the Man Asian Literary Prize. Hi Deepa, it sounds like a truly lovely book. I’m glad that you gave me a link to this. I’m always on the lookout for new titles and new authors. Your blog also looks wonderful! Thank you for the kind words. Jahnavi deals with very transcultural living reflections of humane accross the country.